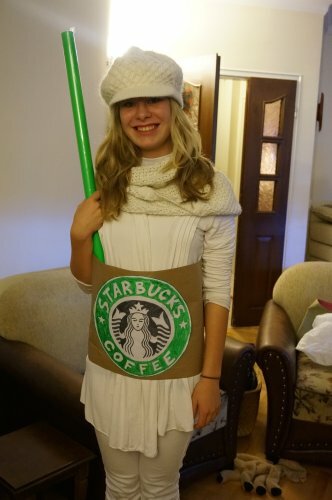 "Starbucks You'll Like a Latte"
Supplies: white pants, white shirt, white cowl or scarf, white hat or beret, brown package paper, roll of solid green Christmas wrapping paper (unopened), printed or drawn Starbucks Logo, sharpie. 1. Create the cup! Draw a Starbucks logo onto white paper or print one in color off Internet images. Glue it to the center of the brown paper. 2. Wear the white shirt, pants, scarf (fluff to make it look like the whipped cream), and hat. 3. Wrap the brown paper around you and tape it securely. 5. For fun, write on the side of your cup if you are tall or venti, decaf, etc!